Humans come in a rainbow of hues, from dark chocolate browns to nearly translucent whites. This full kaleidoscope of skin colors was a relatively recent evolutionary development, according to biologists, occurring alongside the migration of modern humans out of Africa between 100,000 and 50,000 years ago. The consensus among scientists has always been that lower levels of vitamin D at higher latitudes — where the sun is less intense — caused the lightening effect when modern humans, who began darker-skinned, first migrated north. But other factors might be at work, a new study suggests. From the varying effects of frostbite to the sexual preferences of early men, a host of theories have been reviewed. Vitamin D plays an important role in bone growth and the body’s natural protection against certain diseases, and the inability to absorb enough in areas of less-powerful sunlight would have decreased life expectancies in our African ancestors. The further north they trekked, the more vitamin D they needed and the lighter they got over the generations, due to natural selection. 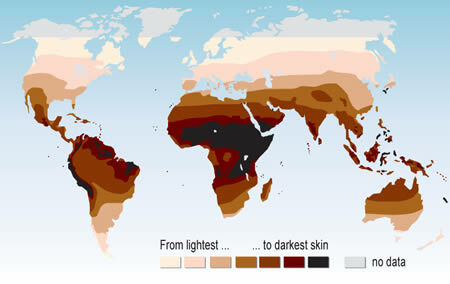 This explanation accounts for the world’s gradients of skin color traveling south to north, the prevalence of vitamin D deficiency among African immigrants to higher latitudes, as well as the relatively darker skin of Canada’s Inuit peoples, who have good levels of vitamin D despite living in the Arctic, due to their diet rich in oily fish. Sexual selection may have played a role, with males preferring paler skin in northern latitudes, the researchers surmised. “One of the hypotheses is that men seem to prefer women with a light skin color, which can be regarded as a sign of youth and fertility,” Juzeniene told LiveScience. “Because light skin characterizes the early infant stage of primates, it may have become a visual cue that triggers appropriate adult behavior toward infants, i.e. decreased aggressiveness and increased desire to provide care and protection,” she said. As lighter skin became associated with increased health in northerly latitudes, men may have preferred mates with lighter skin and produced ever-paler generations. Fertility and health statistics at different latitudes from a few thousand years ago aren’t available, Juzeniene cautioned, however, so the theory is difficult to test. Frostbite was another causal effect investigated by the researchers. Some reports from American soldiers serving in the Korean War and elsewhere have indicated that dark skin is more prone to frostbite than white because it emits more heat. In colder climates, evolution could have negatively selected for paler skin if frostbite was significant enough to perhaps kill darker-skinned children. Despite the anecdotal evidence, there is not enough scientific data to support frostbite as a strong enough single factor to lighten skin in places such as Europe, the researchers said. Another possibility noted was the switch from subsistence-based economies to agriculture approximately 10,000 years ago, which eliminated vitamin D-rich food sources from the diet. This would have had an especially potent effect in northern Europe, according to Juzeniene and her team. The main problem with this agriculture theory is that the switch from gathering to farming occurred relatively recently, and scientists question whether all of the evolutionary changes associated with skin color could have happened so quickly. So Why Did People Become White? Vitamin D remains the most likely explanation given its role in overall health. While people of all skin types have the ability to produce the same amount of vitamin D in their systems, highly pigmented people will need to stay in the sun around 6 times longer than light people in order to synthesize the same amount of vitamin D. A lack of the vitamin — something occurring among many American children right now, partly because they don’t get out much — can make humans more susceptible to everything from heart disease to internal cancers. Why the obsession with lighter skin? Previous PostPrevious How light can your skin get? Men prefer lighter skin…why are whites the minority in the world then? Seriously…?